SAN FRANCISCO, August 28, 2012 -- San Francisco State University was recently ranked one of the "greenest" campuses in the nation by The Princeton Review, receiving a perfect score in an analysis of the campus' environmental practices, policies and academic curriculum. The ranking will appear in The Princeton Review's online profiles of SF State as well as in new 2013 editions of two college guidebooks released by The Princeton Review: "The Complete Book of Colleges" and "The Best 377 Colleges." The organization's annual "Green Honor Roll" rankings take into account sustainable practices in student life, the school's overall commitment to environmental issues and whether the academic curriculum is preparing students to face environmental challenges. Out of a field of 806 colleges and universities analyzed by The Princeton Review, SF State was one of only 21 universities that received a perfect score. "This award recognizes that SF State continues to be a leader in sustainability and urban sustainability in particular," said Davin Wentworth-Thrasher, sustainability coordinator at the University. "We're very proud -- this was a collective effort by students, faculty and staff." There were a number of top sustainability initiatives at SF State in the past year that contributed to the ranking, said Wentworth-Thrasher. In partnership with PG&E, the University opened a clean fuel cell plant that saves the campus $12,000 per month in waste heat recovery. A grant from the California Public Utilities Commission made possible new landscaping practices that have captured 100,000 gallons of rainwater. LED lighting was recently added to the main parking garage to save energy. The Princeton Review officials noted that there is rising interest among students to attend a college or university known for its sustainability practices. A recent survey found that 68 percent of college applicants reported that having information about a campus’ commitment to the environment would affect their decision to apply to or attend a school. 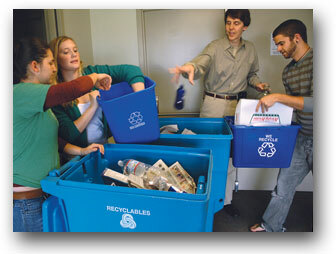 "We make sure everyone is part of the culture of sustainability here at SF State," said Wentworth-Thrasher. "Sustainability is an issue that all future generations are going to have to be thinking about. The change-makers of tomorrow need these tools, and being able to go to a school that provides those is a huge boost." SF State was among the first universities in the country to include a sustainability requirement in general education requirements -- the requirement was conceived in 2010 and will take effect in fall 2014. In order to graduate, future students must take three units of classes that examine an aspect of environmental sustainability. Sustainability components are also built into several majors, community service opportunities, and fields of study. Environmental research opportunities are available at the University’s Romberg Tiburon Center for Environmental Studies and Sierra Nevada Field Campus. A profile of SF State’s efforts and more information about the Green Honor Roll appear on The Princeton Review website and in the 2013 editions of "The Best 377 Colleges" and "Complete Book of Colleges." SF State is the only master's-level public university serving the counties of San Francisco, San Mateo and Marin. The University enrolls nearly 30,000 students each year and offers nationally acclaimed programs in a range of fields -- from creative writing, cinema and biology to history, broadcast and electronic communication arts, theatre arts and ethnic studies. The University’s more than 212,000 graduates have contributed to the economic, cultural and civic fabric of San Francisco and beyond.